Dental hygiene is one of the most important aspects of basic self-care that can often be overlooked. Many people associate dental hygiene with their outward appearance like the colour of their teeth, its lustre, and their breath. However, did you know that dental hygiene extends even further and can make a significant impact on our health? It can become really easy to forget to see a dentist and prioritize dental hygiene in Toronto with the hustle and bustle of modern living. Seeing a dentist regularly will not only keep your teeth looking great but it can prevent a number of health problems that can arise. Like seeing any health care practitioner, regular visits help a dental professional notice these problems before they go into its late stages. Here is a little more insight on dental hygiene and its role in promoting good health. Our mouths are passageways to the rest of our body. That means, the way we tend to them affects many sensitive areas that can easily be subject to disease. Think about it: our mouths encompass our lips, tongue, cheeks and our hard and soft palate while also connecting our pharynx inside our throat and our sinuses. If we fail to maintain our dental hygiene over time, we are putting all of these areas of our body at risk. Lifestyle choices make a huge difference to how we can care for our dental hygiene and our body. Those who work nights, stay up late, or don’t have a regular hygiene schedule are at even more risk for tooth problems and dental diseases because it becomes harder to maintain a regular dental hygiene schedule. Diet considerations can also affect the mouth as bacteria is often formed from binge eating or having an unbalanced diet. On top of this, drinking and smoking can have a large impact on oral health too. When you combine all of these factors, there’s even more of a need to prioritize dental hygiene and frequent cleaning. One large study conducted in europe showed that half a million oral cancer cases around the world (with 75% of them being in North America), were linked to excessive drinking, the use of tobacco products and not seeing a dentist regularly. Binge drinking and smoking actually weakens the cells inside the mouth, reducing our ability to fight off infections and if it is not caught, it can lead to half a million deaths each year. Between regular cleanings that look out for other common dental problems such as cavities, periodontitis (gum disease) and gingivitis, oral cancer screenings can also be conducted by your dentist in Toronto on an as-need basis. Oral cancer screenings consist of checking all areas of the mouth for tiny sores or spots while also checking the neck and throat for lumps or enlarged lymph nodes. Given that this is the seventh most common form of cancer, it is recommended that adults who smoke, drink or have a history of oral cancer in their family, have an oral cancer screening once every three years. The good news is, if oral cancer is detected by your dentist at an early stage, it is possible that treatment can be given at a time that can reduce risk factors. 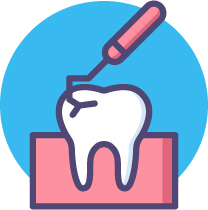 If you’re looking for a friendly and professional dentist in Toronto to improve your dental hygiene, please get in contact with us today to book your next appointment!